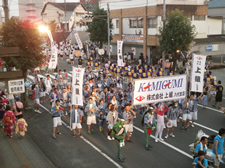 Participation in Community Programs｜Sustainability｜Kamigumi Co., Ltd.
As an society to practice sound enterprise, our company joins in variety of activities (reforestation, participating in local events, and more) to contribute the local communities. 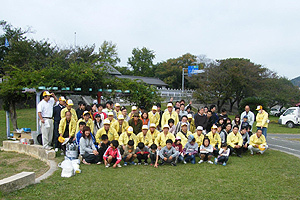 Kamigumi has sponsored a number of programs run by the Kobe YMCA, which carries out a wide range of activities for youth through camps, sports, and language classes. The Kobe YMCA, located in Kobe where Kamigumi was founded, works to develop talented and well-rounded people who will be future leaders and foster a lifelong healthy mind and body through various programs, most notably camping programs held in various locations. Kamigumi decided to sponsor these programs because it endorses the goals of the Kobe YMCA's activities. 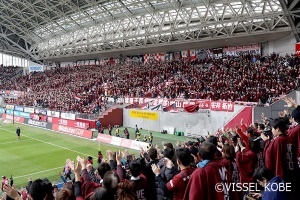 Kamigumi has been a sponsor for the "Social Seats" offered by Vissel Kobe, a professional soccer club with its home stadium in Kobe, since the Japan Professional Football League (J1) 2018 league season kicked off. 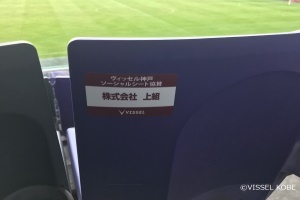 "Social Seats" are special seats reserved by the City of Kobe and Hyogo Prefecture to invite people living in welfare facilities, such as facilities for children orphaned in disasters or for supporting mothers and children, orphanages, senior facilities, and children's clubs, to attend J1 league home games (20 games during the season). Kamigumi decided to sponsor this program because it endorses its goals. 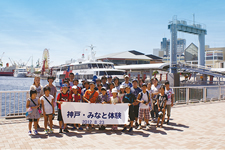 Every year in August Kamigumi holds an event "Experiencing Kobe Port". In the event, local Kobe City elementary and junior high students are invited on an educational tour of our facilities. It gives the students a rare chance to see how distribution equipment and cargo loading works, and to experience the dynamism of Kobe Port. We join in the "Range of Mt. 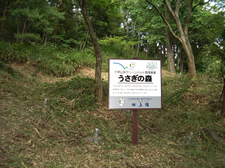 Rokko Greenbelt Development Project", which is now underway by Rokko Sabo Office of Kinki Division, Ministry of Land, Infrastructure, Transport and Tourism. Part of the forest in Nagata-Ku, Kobe City was named "Forest for Rabbits" after the mascot of our company, and conduct planting trees, growing trees and so on for keeping the forest clean. Our thought is that it is the very CSR for our company to preserve and raise the forest of Mt. Rokko which protect from landslide disaster, because our company has been developing with Kobe. We registered with "Environment Pollution Prevention Liaison Council's pull-tab and aluminum can collection program" collecting tabs and cans at all of our branches in exchange for wheelchairs for donation. 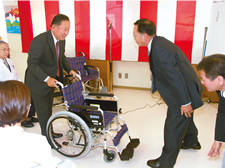 In 2010 we able to donated the exchanged wheelchairs to Minato Nursing Care Facility. 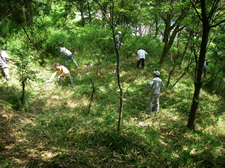 "Kamigumi Dynamite" is formed by strong armed members of our voluntary employees. 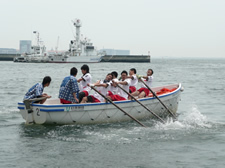 We, Kamigumi, also join sports events such as cutter race which could only held at port town. 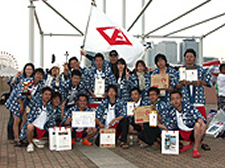 Every once a year, Kobe city exhibits cutter race in order to promote Kobe port city and have friendships among citizens and harbor trans related workers. During the race, we showed the audience the power of our teamwork. "Yatsushiro Kumagawa festival" is the biggest festival of Yatsushiro city taken on every August. More than 6,500 people march the main street of the city. All members of our office also practice marching and dancing hard for it. And after the festival we clean the street with people. We actively participate in local cleanup drives held by public community organizations/economic and citizen groups. We work together with local citizens to help beautifying communities and preserving the environment.